America’s official gold bullion coin, the Gold Eagle, is one of the most sought-after coins in the world. These coins bear iconic American symbols and are produced by the state-of-the-art facilities at the United States Mint. 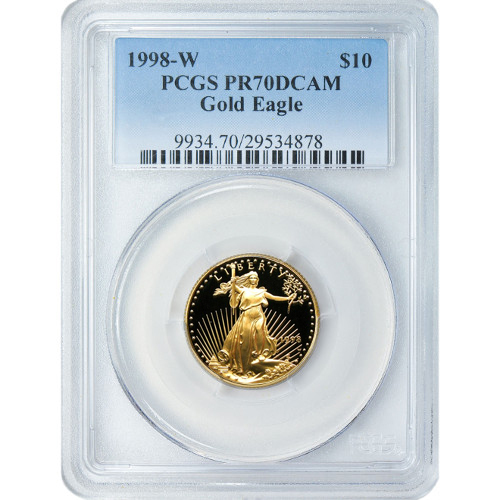 Now, you can own a 1998-W 1/4 oz Gold American Eagle from Silver.com with a “W” mint mark and PR70 grading from the Professional Coin Grading Service. Each of these coins features a deep cameo, or DCAM, appearance. The US Mint achieves this visual imagery by striking individual coins multiple times. The result is a deeply mirrored, clear background field with an overlaid design that is strong and frosted. The “W” mint mark on these 1998 Gold American Eagles signifies they originated at the West Point Mint. PR70 grades are reserved for coins with a perfect minting. The United States Mint has a 223-year history that makes it one of the oldest in North America. It was formed following passage of the Coinage Act of 1792 by Congress and still operates today minting currency and bullion coins. We encourage you to contact us whenever you have a question abut our products or services. Silver.com associates are available via phone at 888-989-7223 or online using our live web chat.